Real talk time: our family is quite large. While we don't yet command our own TLC reality series, my wife and I do instigate double takes almost any time we mention how many kids we have (eight total, six aged ten down to infant). Now, it may come as a complete shock to you, but for whatever reason, a fair number of people seem to feel obligated to comment as to why they personally disapprove of large families. 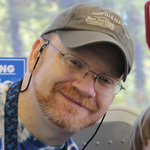 Don't get me wrong - I personally think that these people can take their opinions on a long walk off of a short pier - but one that sticks out is a take we hear with surprising frequency where the windbag in question shares how they "could never have that many kids, as it isn't fair to them, that you just can't make things special for so many children." Go ahead, imagine the expression of "I'm not going to bother hiding my contempt" on my face. I'm sure that you can picture it. Now, I'm not going to pretend that we can dote on each and every one of the six younger kids like some single kid parents do with their one child. But to suggest that it isn't fair to them, that we can't make things special? This sentiment is not only deeply insulting, but is patently false. This past Friday was Elowyn's third birthday. Now understand, she will have a birthday party in a couple of weeks, and it will be Minnie Mouse themed (as she has been demanding for at least six months). Her party will feature a beautiful, delicious, professionally made birthday cake, as well as my wife's deep creativity and stellar eye for decorating. But it has always been the tradition in our house that on your actual birthday, you get to choose a special meal (or restaurant to go out to). Elwoyn did not hesitate when asked; she wanted tacos and brownies for her birthday meal. 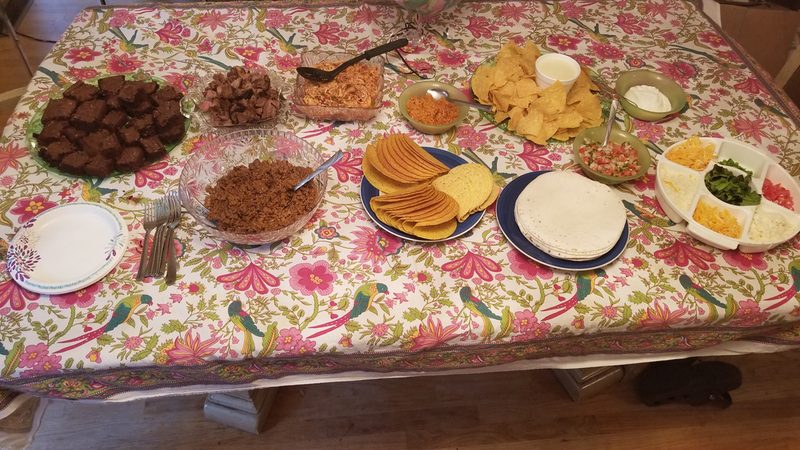 If it goes on a taco, it was probably on this table. After dinner (I had one taco featuring each type of meat, and may have pilfered a few extra pieces of steak), it was time to sing "Happy Birthday". Now, you may recall that Elowyn specified brownies for her dessert (perhaps due to the fact that she knew she would be getting a cake at her party). So... I grabbed three candles, shoved them into brownies, and the singing began. After all, you can't very well have a birthday without singing, can you? The birthday girl waits to blow out the candles. When the singing was done, it was time to open presents! For some reason, my children are all genetically predisposed to tear wrapping paper off - sloooooooowly - one quarter-sized piece at a time. Perhaps they worry about tearing the paper or hurting its feelings? Perhaps they choose to savor the experience? Either way, Elowyn carried on this proud tradition, taking five times as long to open her gifts as anyone might otherwise expect. She was excited for every gift, though, so it was tough to be annoyed with her. Some things are simply not to be rushed. Once Elowyn finished opening her gifts, we opened sibling gifts. A tradition in the Suddeth house is that every sibling younger than roughly middle school age gets a single small gift to open when someone else has a birthday. 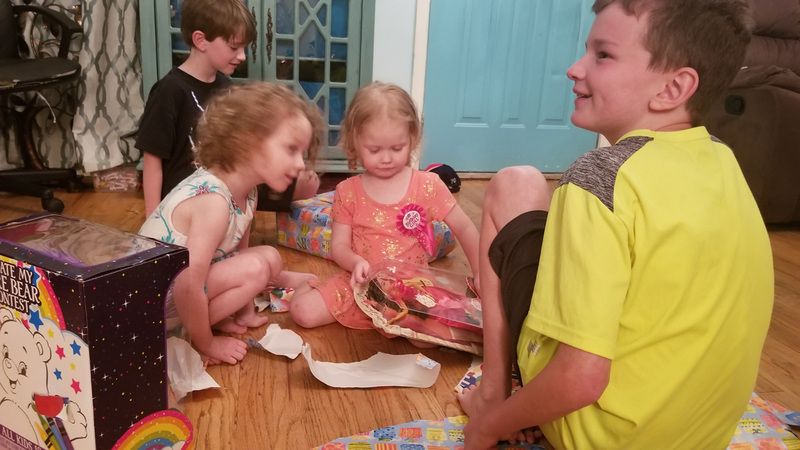 It can be tough to watch another kid open a pile of presents; we feel like this makes birthdays fun and special for everyone, and to help remember that each sibling is worth celebrating. 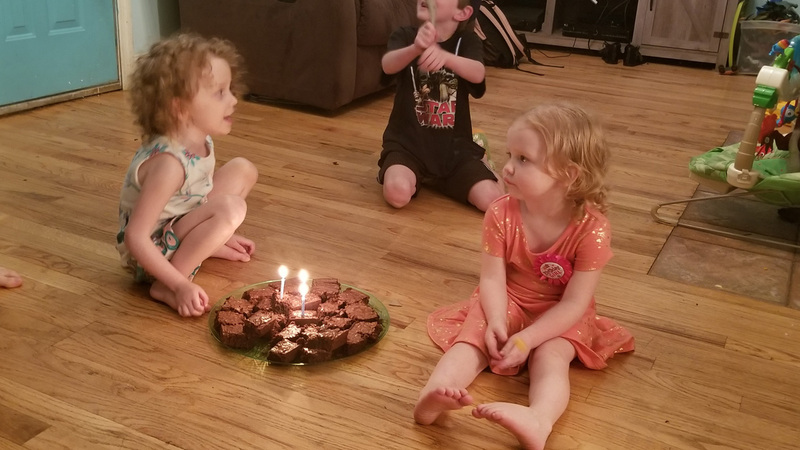 Soon enough, the living room floor was covered in wrapping paper, I was conscripted to the task of opening toys for the birthday girl (and in doing so, removing ludicrous amounts of anti-theft packaging), and brownies began making their rounds. Did Elowyn care that we had all of those taco options and toppings? Not really - she does ground beef, lettuce, and shredded cheese only. Would she have been okay had we skipped the dessert, since she would get a cake at her party? I'm sure that she would have survived without the brownies. Heck, could we have just waited to celebrate her birthday on the day of her party? 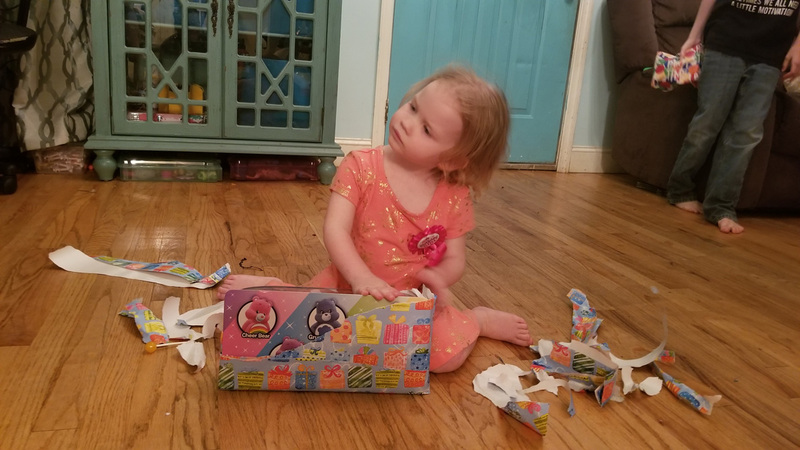 After all, she was only turning three - it's not like she knows what day it is. The point to all of this is that birthdays are special... and every child is special. In our family, we believe in recognizing one another, in celebrating one another, in putting value in special moments. By putting in a little extra effort, we had a really enjoyable "together" family time, and made a little girl feel like she mattered. Which she absolutely does... just like all of her siblings do. Every time we've had a new baby on the way, Donna and I have had the same talk with the older siblings. A new baby doesn't take a share of the love that we already feel for the existing children. What happens is that your heart grows - even though you were already certain that it was full - and makes room for the new baby. Each and every child is special, is precious, and deserves to feel that way. Does it take a little effort and coordination to make that happen in a larger family? Of course it does. It's not just birthdays - it's paying attention to what interests every child. It's spending time on a regular basis with each and every one. It's making sure that they all periodically get the chance to take a "special" trip by themselves with mom or dad to the grocery store, the drugstore, the post office. Making sure to spend time talking to each one about what's going on in their lives, taking time to listen to what it important to them (be that dinosaurs, Minecraft, baseball, or princesses). Sometimes, it's a juggling act. And it's a wonderful thing, despite what some "helpful" people might otherwise believe. 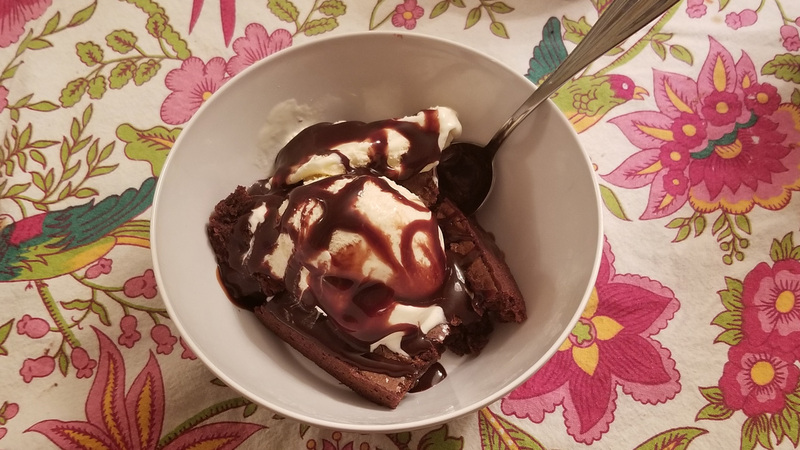 In closing - enjoy this photo of warm brownies topped with vanilla ice cream and chocolate syrup.